3rd lunar month of 1871: born in Ôsaka in the pleasures district of Sôemon-chô. His father is a wealthy Ôsaka merchant, who is a patron of the actor Arashi Rikan IV. It is said that one of his grandfathers was none other than the great actor Arashi Kitsusaburô I. 1875: the family business goes bankrupt and he is adopted by Arashi Rikan IV. 1876: first stage appearance, at the Nakaza, where he receives the name of Arashi Hidejirô and plays in the drama "Keisei Awa no Naruto". September 1881: Arashi Hidejirô takes the name of Arashi Wasaburô III at the Ichimuraza, playing with his adoptive father in the drama "Seki-ga-Hara Tôzai Gunki". June 1882: premiere at the Saruwakaza of Kawatake Mokuami's Nagauta-based matsubamemono "Imayô Mochizuki" (commonly called "Mochizuki"); Wasaburô plays the role of Hanawaka [casting]. Summer 1890: Tokusaburô and his lover elope to Tôkyô after a quarrel with his adoptive father. This affair causes quite a stir in Ôsaka. Tokusaburô goes back to Ôsaka in August and reconciles with Arashi Rikan IV thanks to the efforts of both Kataoka Gadô III and Ichikawa Udanji I. May 1894: his adoptive father Arashi Rikan IV dies. July 1903: Tokusaburô plays at the Bentenza (Ôsaka) the role of Tamate Gozen in the drama "Sesshû Gappô-ga-Tsuji"; his stage partners are Arashi Kitsusaburô IV (Gappô) and Kataoka Gadô IV (Shuntokumaru). 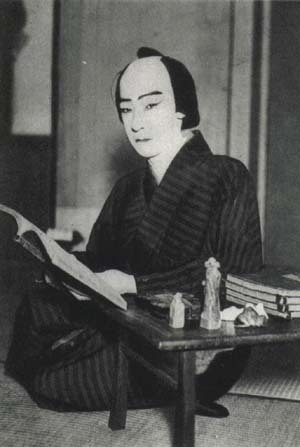 August 1904: Tokusaburô plays at the Kadoza the role of Sôshichi in the drama "Koi Minato Hakata no Hitofushi"; his stage partners are Jitsukawa Enjaku II (Kezori) and Nakamura Shibajaku IV (the courtesan Kojorô). November 1911: Tokusaburô plays at the Nakaza the role of Princess Yaegaki in the "Jusshukô" scene of the drama "Honchô Nijûshikô"; his stage partners are Jitsukawa Enjaku II (Katsuyori) and Nakamura Naritarô I (Nureginu). January 1916: Tokusaburô plays at the Naniwaza (Ôsaka) the role of Tôkichi in the drama "Kinkakuji"; his stage partners are Arashi Ganshô (Daizen) and Kataoka Gadô IV (Princess Yuki). This play is staged with the same casting in April at the Suehiroza (Nagoya). May 1918: Arashi Tokusaburô V takes the name of Arashi Rikan V at the Nakaza. December 1919: Rikan plays at the Naniwaza (Ôsaka) the roles of Kakogawa Honzô, Okaru, Ishidô Umanojô and Momonoi Wakasanosuke in the classic "Kanadehon Chûshingura". Arashi Rikan V was a talented kaneru yakusha, who was very popular in Kamigata and proved that he was the worthy heir of a distinguished line of actors. He retired in Kyôto in the middle of the nineties (of the 19th century) but his numerous fans succeeded in calling him back on stage. He played in many new plays in his latter years. He was nicknamed kakeochi yakusha ("the elopement actor") because of the 1890 love affair.